A recent Sunday started off with a bowl of steel cut oatmeal. 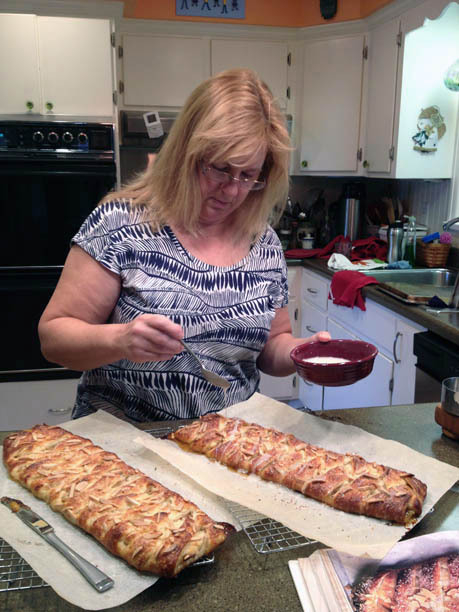 And then my mom and I got to work on a pastry that would send my whole family into sugar-and-butter induced naps soon after. 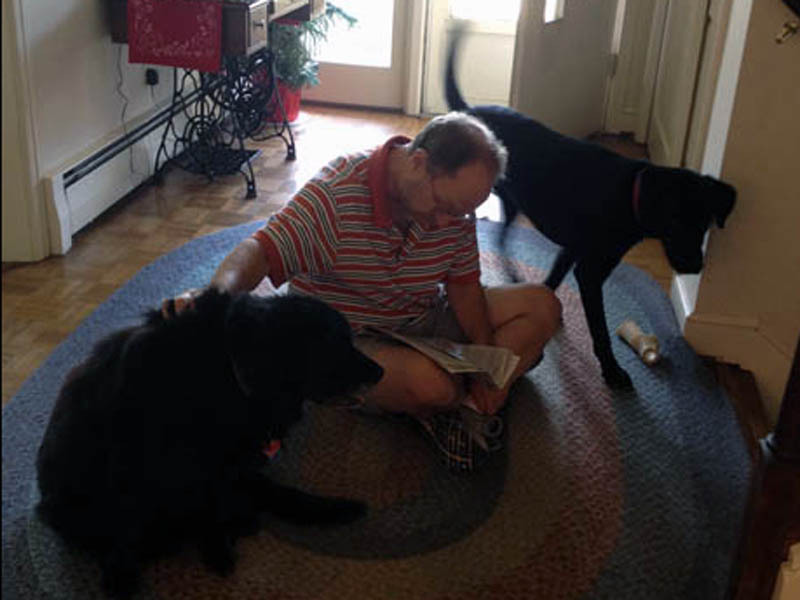 Even the barky old dog and energetic new dog crashed (after a dog park visit), and all was calm and quiet in the Roanoke household for an hour. Upon waking, my body craved an egg to put everything back in balance. Be prepared before you indulge, but either way, you’ll certainly enjoy these Danishes. 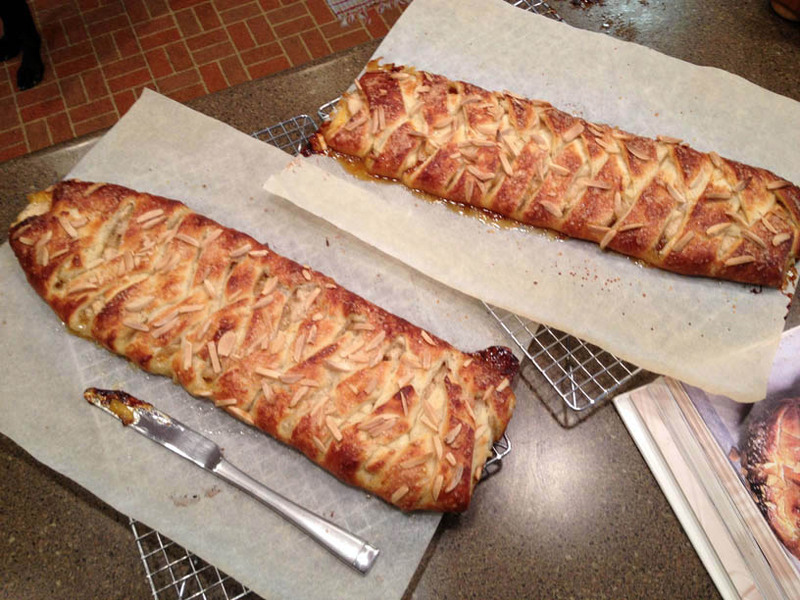 The super-easy Danish pastry dough was mixed up the night before–butter was cut into the flour, and then mixed with milk, yeast, sugar and an egg, and as we slept, the yeast went to work in the refrigerator. In the morning, the dough was puffy with huge chunks of butter sticking out. We questioned if this was right, but the recipe from Dorie Greenspan’s “Baking with Julia” was clear: don’t overwork it. The Danish pastry is similar to the croissants, when butter was spread and laminated between folds of dough to produce flaky layers, with refrigerator time between each step. Here, though no more butter is added during the rolling process, the cubes get flattened and gently worked into the dough. It’s a much faster way to make the delicate layers you expect in a pastry than what was called for in the three-day croissant recipe. 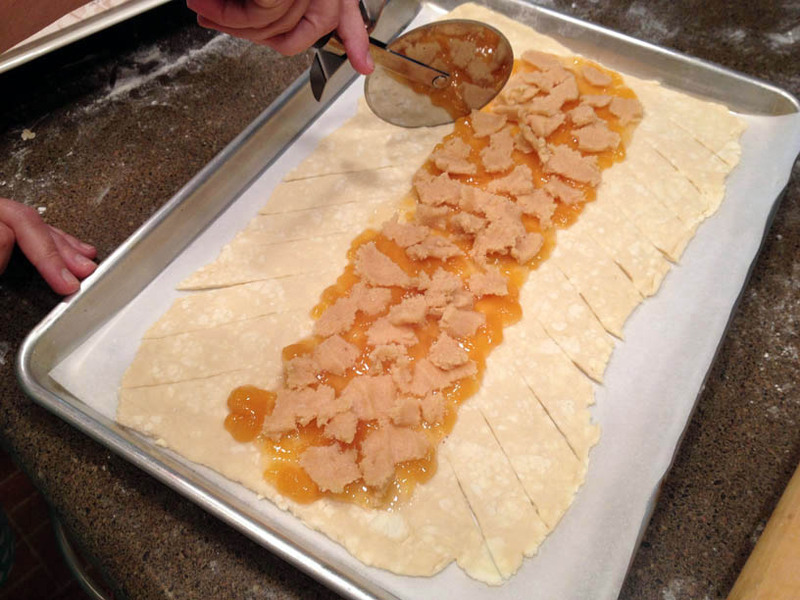 After four sets of rolling-and-folding, the final square is cut into two; you can freeze one-half for a later pastry, or make two braids, like we opted to do. Then it’s time to make the braids, by rolling the dough into a long rectangle, filling the middle third, cutting diagonal cuts into the two outer edges and then folding the strips across the filing to make a braid. Sugar and almonds are scattered on top to finish, before the pans get popped in the oven. As they cool, the puffed pastries settle slightly and the fillings firm up. Leftovers the day after were just as tasty as warm slices. A few notes: The cookbook offers five different fillings, and suggests combining a fruit with either almond or pastry cream. A new jar of peach jam seemed a fine stand-in, as did leftover apricot jam in the back of the fridge for the second braid. We thinned the thicker apricot jam with water, but that probably wasn’t necessary–it took longer for the cooked braid to set up. 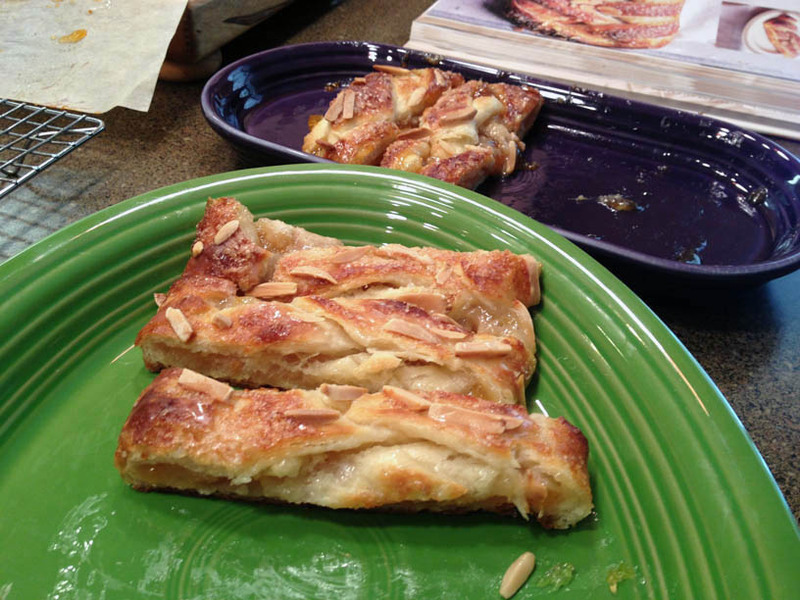 A full recipe of almond filling easily split in two, though the recipe says you’ll need one recipe per braid; the almond filling from the croissant recipe may have been better, in my mom’s opinion. Also, the coffee-powdered sugar glaze didn’t sound appealing, so we used milk in it instead. But it turned out to not really add much to the final pastry, so we’d skip it next time. It’s been a while since we made a Tuesdays with Dorie recipe, but many just didn’t appeal to us. Really, we were waiting until just the pastries were on the schedule. Find out what other bloggers thought of the Danish braid here. Pour the water into a large bowl, sprinkle over the yeast, and let it soften for a minute. Add the milk, egg, sugar and salt and whisk to mix; set aside. Empty the contents of the food processor into the bowl with the yeast and, working with a rubber spatula, very gently turn the mixture over, scraping the bowl as needed, just until the dry ingredients are moistened. Again, don’t be too energetic–the butter must remain in discrete pieces so that you will produce a flaky pastry, not a bread or cookie dough. Cover the bowl with plastic wrap and refrigerate the dough overnight (or for up to 4 days, if that better suits your schedule). 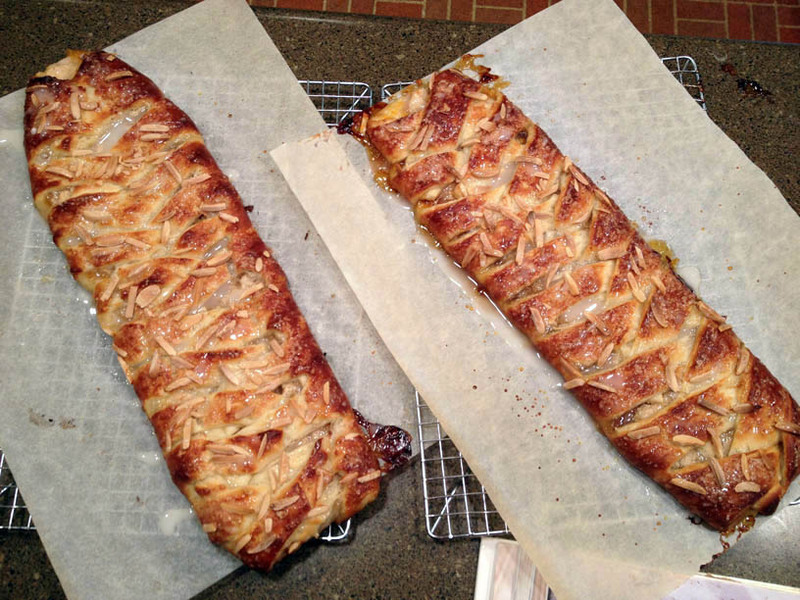 Roll the dough out again, this time into a long narrow rectangle, about 10 inches wide by 24 inches long. Fold the rectangle in thirds again, turn it so the closed fold is to your left, and roll it into a 20-inch square. Fold the square in thirds, like a business letter, so that you have a rectangle, turning it so that the closed fold is to your left, and, once more, roll the dough into a long narrow rectangle, 10 inches wide by 24 inches long. 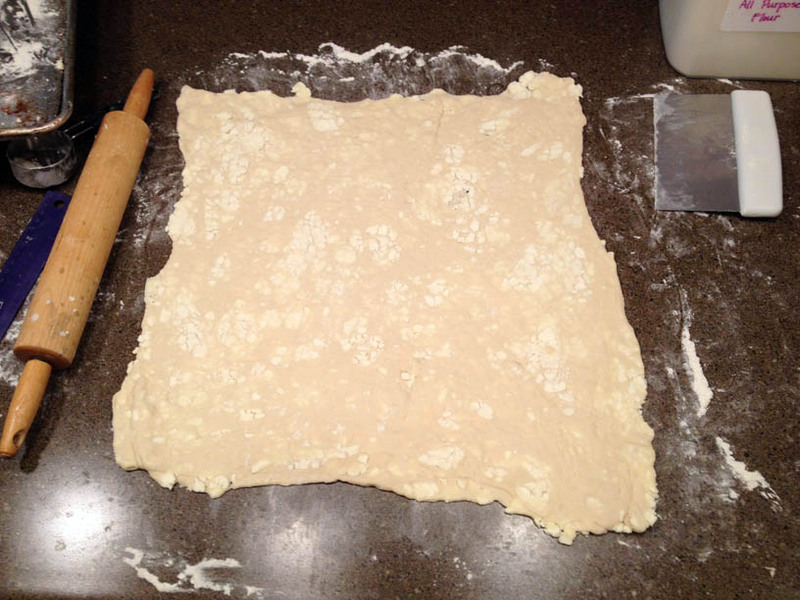 Fold in thirds again, wrap the dough well in plastic wrap, and chill it for at least 30 minutes or up to 2 days. If you only plan to use half now, divide the dough, wrap and freeze the other piece. 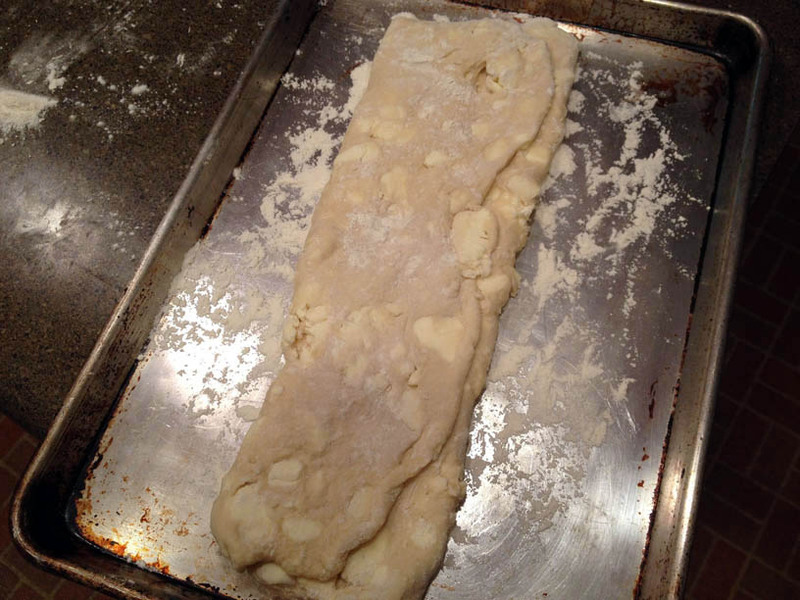 Working on a lightly floured surface, roll the chilled dough into a rectangle 10 inches wide and 16 inches long. Lift onto a sheet of parchment, and position lengthwise on the work surface. Spread some of the fruit filling down the length of the center third of the dough, then top with some of the cream or almond filling, spreading it so that a little of the fruit filling peeks out on either side. Using a pizza cutter or the point of a sharp knife, cut 12 to 14 slanting lines down each side, angling the cuts from the center of the pastry to the edge and cutting strips about 3/4 inch wide. Fold the strips of pastry into the center, criss-crossing the filing by alternating one strip from the left side with one from the right. 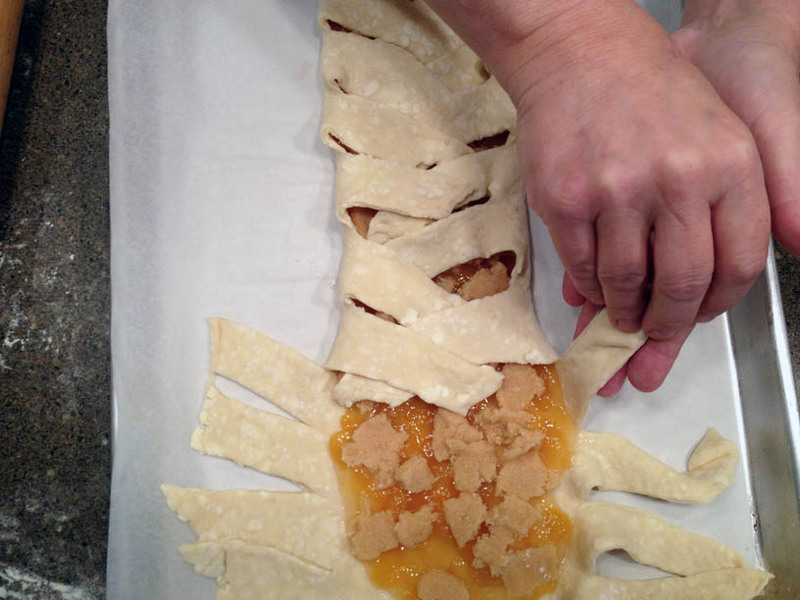 Lightly press the ends together to seal and run your hands along the sides of the pastry to straighten them. Brush the pastry with the beaten egg white and sprinkle with pearl sugar and almonds. Cover with a kitchen towel and allow it to rise at room temperature for 30 minutes, until it looks and feels puffy; it will not double. Center a rack in the oven and preheat to 400 degrees. Slide the braid, paper and all, onto a baking sheet; bake for 15 to 20 minutes, or just until golden. Transfer the pastry to a cooling rack. If desired, make a glaze with 1/2 cup confectioner’s sugar, stirring in 2 or 3 teaspoons cold strong coffee until you have a smooth, shiny glaze. Drizzle on top. (NOTE: We used milk, but the glaze itself seemed unnecessary.) Allow the pastry to set for a few minutes, and serve warm. Put the almonds, sugar and butter in the work bowl of a food processor fitted with the metal blade. Process until the almonds are finely ground, stopping to scrape the bowl as needed. Add the almond extract and 2 tablespoons of the beaten egg white and process to mix. Pack the filling into an airtight container and store in the refrigerator until needed. Bring to room temperature before using. Great post. And I love all your pics. Your Danish braids look fabulous! I have been thinking about this all day. Read the post first thing this morning. Absolutely beautiful! Loved the family pics. The dough recipe looks similar to the cheaters’ danish pastry recipe I have tried from Nigella. I need to compare. Love trying something new, and that pastry looks scrumptious! two gorgeous braids! I was really surprised by what a great Danish this “quick” dough made. Thanks! 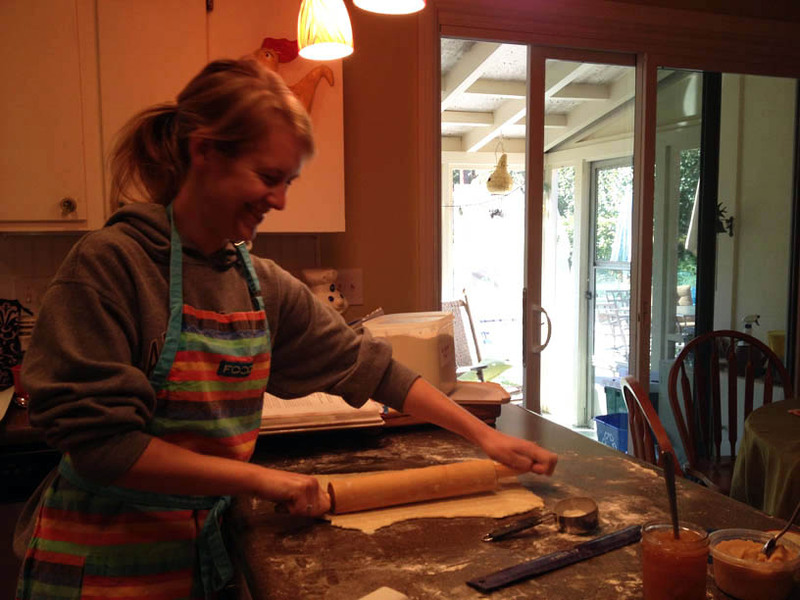 The dough was so interesting too – with the huge chunks of butter. Hope yours turned out well! I agree your Danish looks fantastic!. Looks good! I wish I had made two. I went for seconds and it had already disappeared. I had the same thought of the coffee drizzle – unappetizing. I skipped it altogether.